After Prime Minister Theresa May's withdrawal agreement was defeated twice, MPs will look at other options. 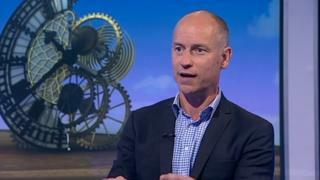 Aberavon's Stephen Kinnock said "Common Market 2.0" puts "flesh on the bones of Labour's formal policy position". The UK was due to leave the EU on 29 March but after MPs failed to agree on the terms, it has been pushed back. Meanwhile, Conservative MPs David TC Davies and Robert Buckland have said brokering a deal this week must be a priority. On Wednesday, MPs are expected to be allowed a vote on a range of Brexit options, in an attempt to achieve majority support for one way forward. These include cancelling Brexit, holding another referendum - which is favoured by many Labour MPs, and leaving without a deal. Mr Kinnock has for a long time made calls for the UK to remain as closely aligned to the EU as possible. He told Sunday Politics Wales the "Common Market 2.0" plan would see a relationship similar to what Norway enjoys with the EU, with access to the single market. But opponents have said this would leave the UK too closely aligned with the EU's rules such as making financial contributions and an element of freedom of movement. Mr Kinnock said he had held very "constructive and productive" discussions with Jeremy Corbyn and Labour's Brexit spokesman Keir Starmer. "I believe that this is a real opportunity to re-set our relationship with the European Union and to have one based on democratic consent," he said. "We don't want to be part of that deeper, more political union but we want the Common Market, we want that strong market-based relationship." Meanwhile, solicitor general Robert Buckland said people were "fed up of uncertainty". "The Europeans are running out of patience. They've spent a lot of time on this," the Llanelli-born, Conservative South Swindon MP told BBC Radio Wales' Sunday Supplement programme. "They had to wipe out a large part of their agenda. They wanted to talk about China and other issues to do with the internet. "They've spent a lot of time on Brexit. They want this over." He said he wanted the votes of MPs on options to be "tempered in the light of that reality". "They (the EU) have made it clear - the way out is the withdrawal agreement," Mr Buckland added, in a plea for MPs to get behind Mrs May's twice-defeated deal. And Monmouth MP David TC Davies said Theresa May had to do "whatever it takes" to get a Brexit deal agreed this week - even if it means standing down.